Turret style check valves with mica discs. Nickel plated brass oxygen flush valve. Five legged base for maximum stability. Anodized aluminum flowmeter with nickel plated brass needle valve and fused glass scale reading from 0.2 to 4 LPM. Only one knob for easy changing of soda lime. Scavenging pop off valve of nickel plated brass. Vaporizer bracket adapts to a variety of precision vaporizers. Common gas outlet accepts standard 15mm adapters. Large pressure gauge allows precise control of manual lung ventilation. There's even a place for the syringe used for inflating cuffs. Precision vaporizers, new or rebuilt. Nitrous oxide flowmeter assembly with cutoff. Low flow oxygen flowmeter in series with standard flowmeter. 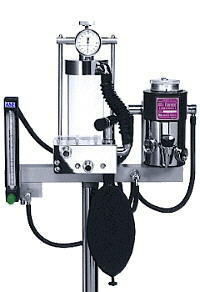 Machine-mounted yoke and regulator assemblies for one or two oxygen cylinders, or one oxygen and one nitrous oxide cylinder. Oxygen and nitrous oxide regulators for large (H-size) cylinders. Dual vaporizer adapter to allow use of two inhalation anesthetic agents (e.g. halothane and isoflurane). Wall or table mount assemblies. Custom configurations constructed to your specifications. ASE can supply a variety of rebuilt machines, both in pole-mounted and cabinet configurations. Most rebuilt machines carry a two-year warranty. Since our inventory is constantly changing, it is not practical to provide an on-line catalog. If you are interested in obtaining a high-quality rebuilt machine, contact the ASE office nearest you for current availability.